10-in-1 Media Solution to Download, Convert, Copy, Burn, Play, Edit, and More in 6X Faster Speed.An ultimate media solution to download online videos and audios; convert videos, DVDs, and Blu-rays; copy DVDs and Blu-rays; burn videos to DVD and Blu-ray; edit videos, DVDs, and Blu-rays; play videos, DVDs, and Blu-rays; and so on. Special 40% OFF Sale for GOTD users. 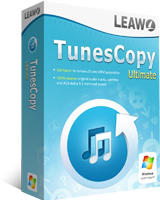 Leawo TunesCopy Ultimate is an all-in-one iTunes DRM removal suite, which integrates DRM video converter, DRM music converter and DRM audiobook converter into the program suite. Special 40% OFF Sale for GOTD users. Rip Blu-ray DVD to 180+ video/ audio with 100% original quality and 6X faster speed. Leawo Blu-ray Ripper can rip and convert Blu-ray to video and extract audio from Blu-ray to save in all formats for any media player and device. Special 30% OFF Sale for GOTD users. Leawo Blu-ray Copy offers you the best solution to copy Blu-ray or DVD movie without quality loss. This Blu-ray copy software can copy Blu-ray disc of BD25 and BD50, copy Blu-ray folder and ISO image file, copy DVD disc of DVD-9/DVD-5, DVD folder and DVD ISO image file as well. Special 30% OFF Sale for GOTD users. 1 year only is NOT a giveaway. Is an extended trial. Although a version-lifetime giveaway is always preferable to any other, I don't think most people would find it unreasonable to have a 12-month licensed product. Anything less than that, I'd also regard that as an extended trial. But 12 months' free usage is long enough to decide if the software is worth buying. Leawo's habit of bundling its apps into a "suite" means that today's download is over 100Mb, 80% of which will not be usable (unless purchased from Leawo.) I know disk space is nowadays as cheap as it gets, but I'm not in the habit of cluttering my drive with stuff (a) I don't want (b) never asked for and (c) don't wish to be reminded of every time I open the program and see five other "modules" on screen that are irrelevant to the task upon which I'm embarked. If Leawo wishes to promote its ripper on a giveaway, then it should do just that: it's the single product in which folks might be interested in using, not the entire store. Mangina, Although a version-lifetime giveaway is always preferable to any other, I don't think most people would find it unreasonable to have a 12-month licensed product. Anything less than that, I'd also regard that as an extended trial. But 12 months' free usage is long enough to decide if the software is worth buying. Thanks, then, to Leawo for offering this, as my experience has been that its ripper is just as good as others. Unfortunately though: Leawo's habit of bundling its apps into a "suite" means that today's download is over 100Mb, 80% of which will not be usable (unless purchased from Leawo.) I know disk space is nowadays as cheap as it gets, but I'm not in the habit of cluttering my drive with stuff (a) I don't want (b) never asked for and (c) don't wish to be reminded of every time I open the program and see five other "modules" on screen that are irrelevant to the task upon which I'm embarked. If Leawo wishes to promote its ripper on a giveaway, then it should do just that: it's the single product in which folks might be interested in using, not the entire store. Mangina, I agree they chose the cheapskate giveaway of the subscription model and not the $10 more lifetime license but with no updates and support like a real giveaway. They took a perfectly brilliant marketing tool and sabotaged it by forcing it into an upsell tool which is not what a giveaway of the day is! Despite the heavily biased user votes towards thumbs up by design they are going to be receiving a lot of thumbs down votes simply because of the license model they chose to giveaway today.... maybe one day these vendors will learn... skimp out on marketing and you cease to market your product in a positive light. It may just be an update Mick but is it any good that's the question ?. Comments on the actual programme would be more helpful to me not what version it is or is not thanks. why doesn't someone just offer up whether the software is good or not and stop complaining that it's only 12 months?? Laura, The answer is simple. One likes to deal only with people who are honest and truthful, not deceiving by calling something what it is not. Otherwise there might be some lies in the description or the instructions. By all means offer a free trial for a month, or a year, or even ten years, but call it a free trial. What we hate is calling it a giveaway when it is not. Go to a public library and borrow a book. A special offer for borrowing this book allows you to keep it for a month (or even a year) instead of the usual fortnight, but at the end of the period you must return it, or pay. This is not a giveaway as the library might do with books that are removed from stock and unwanted by them. Nobody complains that something is offered with a limited licence, as long as they do not call it a gift. Laura, The answer is simple. One likes to deal only with people who are honest and truthful, not deceiving by calling something what it is not. Otherwise there might be some lies in the description or the instructions. By all means offer a free trial for a month, or a year, or even ten years, but call it a free trial. What we hate is calling it a giveaway when it is not. Go to a public library and borrow a book. A special offer for borrowing this book allows you to keep it for a month (or even a year) instead of the usual fortnight, but at the end of the period you must return it, or pay. This is not a giveaway as the library might do with books that are removed from stock and unwanted by them. Nobody complains that something is offered with a limited licence, as long as they do not call it a gift.